Gulzar is a multifaceted personality; a film maker, poet, lyricist, short story and script writer - all in one. He was born on 18th August 1936 in Deena, Jhelum district (now in Pakistan). Even as a child he loved music and wrote poetry. After partition he left his home town and came to Delhi. 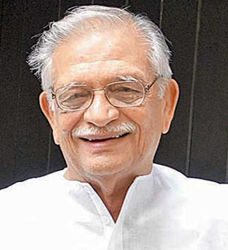 Sampoorna Singh Gulzar began his career in films as a lyricist. He started working as an assistant to Director Bimal Roy and wrote his first lyrics for the song 'Mora Gora Ang Layi Le' in Bimal Roy's film 'Bandini'(1963). Later for 'Kabuliwala', 'Sannata', 'Khamoshi' and many other films giving out all time hits. Then he turned to script writing and worked for famous directors like Hrishikesh Mukherjee, Basu Chatterjee, Asit Sen, Buddhadev Dasgupta, and Kumar Shahani. He wrote stories for around 60 films. In his film career spanning three decades, he directed around 17 movies; 'Maachis'(1994) and 'Hu Tu Tu'(1998) being the latest. All his films are superb in direction, dialogue and performances. He has won many awards; more recent being the best lyricist Filmfare award for 'Dil-Se'.